For most people, travel almost inevitably accompanies the holidays. That's why every gal should have a reliable weekender-style handbag to carry with her on those unavoidable plane, train, or automobile trips. Reliable doesn't have to mean uninteresting, however. On the flip side, chic and stylish shouldn't always equal an outrageous price. That's where this Liz Claiborne Jet Setter satchel fits in beautifully. It's a nice, happy medium for the two extremes. Though not an enormous travel bag, the Jet Setter satchel is large enough for essentials or to use as a carry-on bag for plane trips. It's bigger than what most of us tote around for an everyday purse (except for women who adore the overly oversized bag trend, of course), but isn't so bulky that it becomes difficult to haul around an airport terminal. There are several exterior pockets ideal for items you need to access at a moment's notice. The double handles might be expected for this style of handbag, but they're definitely too short for my practical taste. I'm guessing that the longer carrying strap is much more useful. 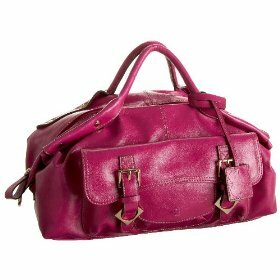 This pretty fuchsia color, termed "laurel" by Liz Claiborne, is an unexpected twist for a travel bag and a fun pop of color for an outfit. The faux leather Jet Setter satchel is priced at a reasonable $95. The Jessica Simpson Aer Weekender Bag, a great alternative to this faux leather travel bag.